Monday and Tuesday I had to rack up the miles to stay on schedule for Kingman. This meant driving way more interstate than I'd prefer. On Monday I strayed into El Reno, Oklahoma, for a good share of the day. Today I stayed on I-40 except to pop onto 66 a few times for food, photos, and a little feel of the old road. El Reno, Oklahoma, is a Route 66 city west of Oklahoma City, born of the late 1800s land rush and survivor of the May 2013 widest tornado in recorded history. 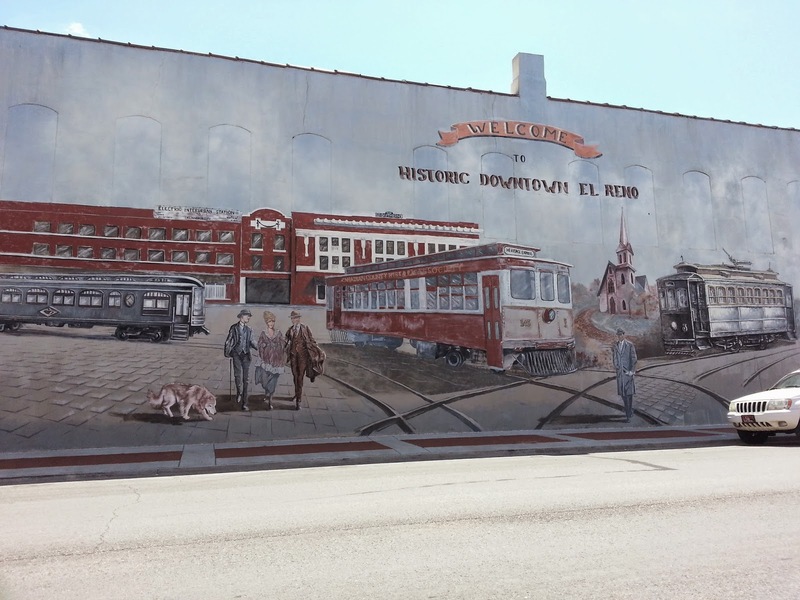 Murals adorn many of the older buildings in town and the "Heritage Express Trolley" runs about a mile loop through the downtown. 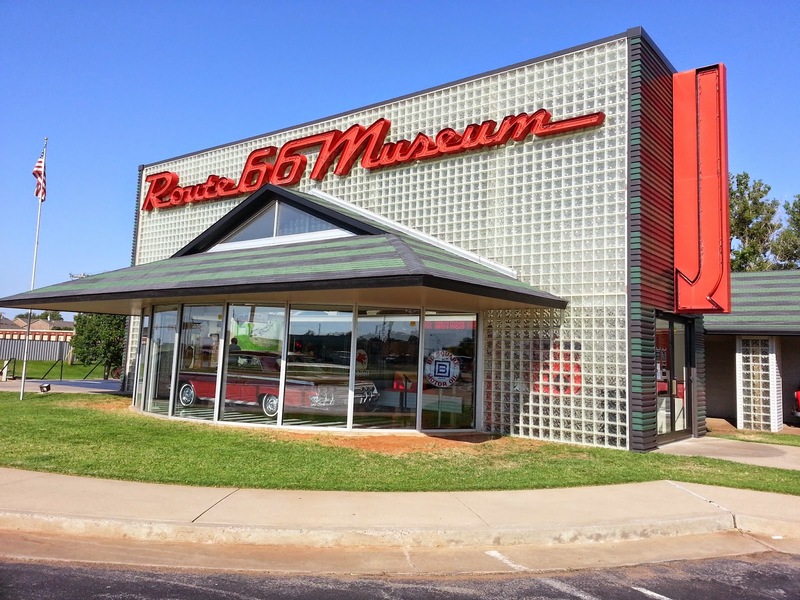 Two terrific Route 66 Museums stand ready for visitors just 28 miles apart, in Clinton and Elk City in western Oklahoma. Both have great displays and nice gift shops. 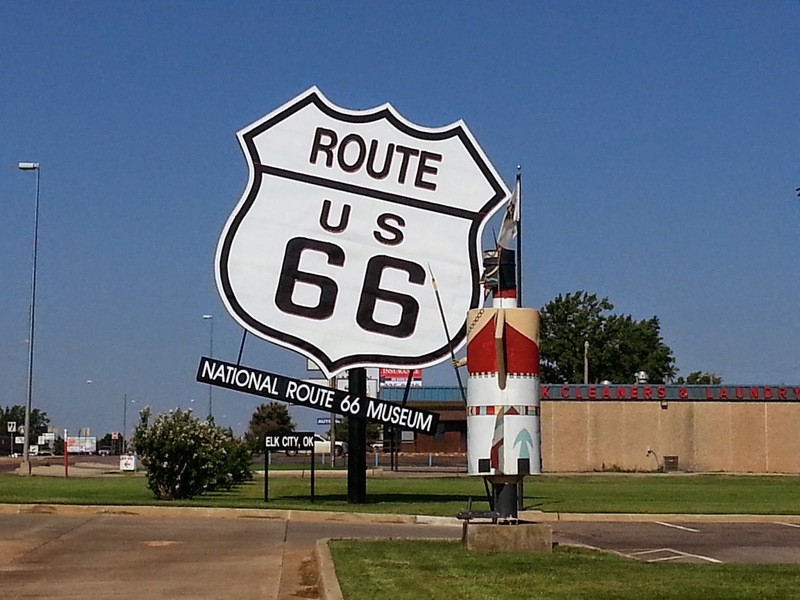 A high point of a Route 66 trip is the midpoint. 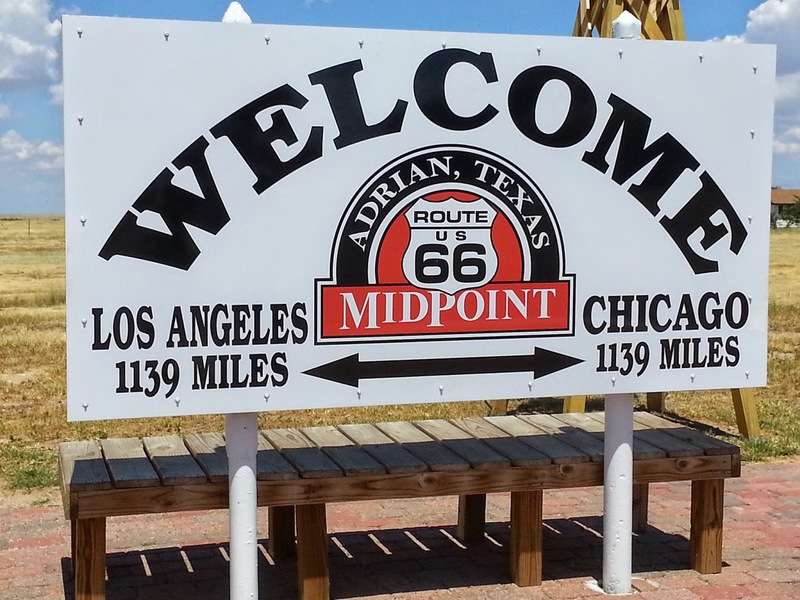 Yes, in Adrian, Texas, it's been calculated that you are at the midpoint of Route 66, halfway between Chicago and Los Angeles. An attractive young couple from Italy arrived at the same time I did and we all headed for the Midpoint sign for photos. Inside the cafe I ran into St. Louis friend and roadie Roamin' Rich Dinkela and his buddy. An American couple were at the counter finishing off their meal. As we chatted with new owner Dennis Purschwitz (well, as of 2012) and the Italian couple, three French visitors came in. Route 66 is truly a community. It's hard to go anywhere along the route and not run into old or new friends. 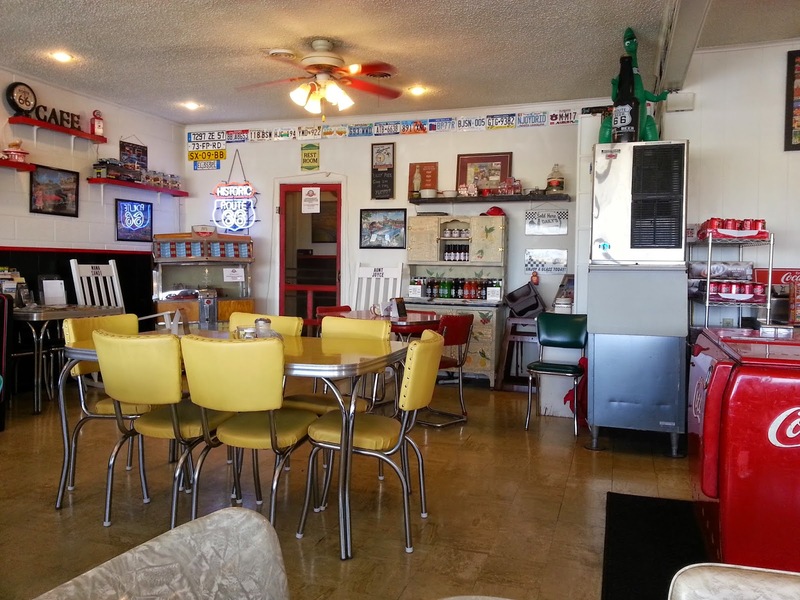 The food and service are great at the Midpoint Cafe, and there's a really good gift shop. I had a huge turkey-burger basket with potato salad - yum - and left with a brown bag from the shop full of goodies for family and friends. 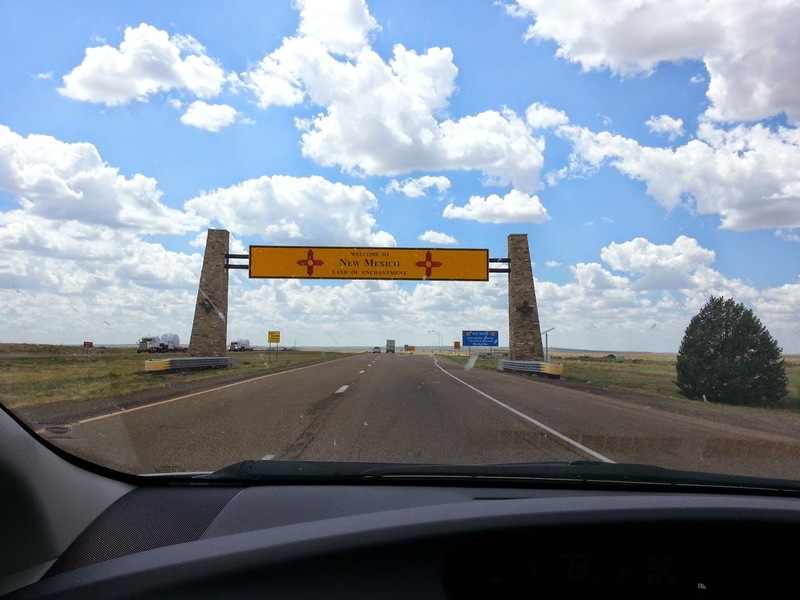 Then it was back on the highway for the last few miles in Texas and a couple hundred miles of fast highway, blue skies, and tablelands in New Mexico. Happily, I'm with family in Albuquerque tonight.